The NGS in the agrigenomics market is expected to reach $1,389.0 million at a CAGR of 12.5% from 2016 to 2021. This growth is attributed to the advancements in the genomic technology with a variety of post-sequencing analysis techniques and governmental support in the developed countries. The rising world population has resulted in an increase in the demand for food, while there has been an increase in the loss of crop and livestock-based food due to genetic concerns and climatic factors. The world population is expected to reach 9.7 billion by 2050, which further stresses on the need to employ advanced technologies so that we can ensure sustainable productivity growth in agriculture. Agrigenomics provides an effective solution to the rising concerns by improving the productivity factor of the farmers. Agrigenomics helps the farmers, breeders, and researchers in identifying the genetic sequences which can be used to determine desirable traits and make better breeding decisions. With food security gaining increased importance in the worldwide scenario, the government of various countries across the globe are promoting the use of technologies like genomics and sequencing in the field of agriculture. The process of relating the agriculturally important characteristics like meat quality with one or more genes is important for ensuring better farm-outputs. Agrigenomics also helps in improving aquaculture, where desirable characteristics like disease resistance, and increased stress tolerance can be induced in the aquatic organisms. 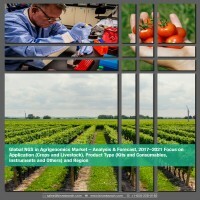 The report is a compilation of the different segments of the global NGS in agrigenomics market, including market breakdown by application, product type, and different geographical areas. Herein, the revenue generated from the different product type, namely, kits & consumables, instruments and others; application; crops and livestock, are tracked to calculate the overall market size. While highlighting the key driving, and restraining forces for this market, the report also provides a detailed summary of the market. It also includes the key participants involved in the manufacturing and distribution of these products. • What was the size, in terms of value ($million) of the NGS in agrigenomics market in 2016, and what will be the growth rate during the forecast period, 2017-2021? • What are different sequencing products being supplied by the key players in the NGS in agrigenomics market? • What was the revenue generation of NGS in the agrigenomics market for different applications in 2016, and what is their growth prospect? • What is the market size of different kits and instruments, in terms of value and their respective growth prospects and key developments? • What is the NGS in agrigenomics market size for different regions, on the basis of various types and application? • How attractive is the market for different stakeholders present in the industry by analyzing the futuristic scenario of NGS in agrigenomics market? • What are the major driving forces that tend to increase the demand for NGS in agrigenomics market during the forecast period? • What are the major challenges inhibiting the growth of the global NGS in agrigenomics market? • What is the competitive strength of the key players in the NGS in agrigenomics market by market share analysis? • Who are the key market players in the market, along with their detailed analysis & profiles (including company snapshots, their financials, key products & services, and SWOT analysis)? The report puts special emphasis on the market share of the leading companies in the NGS in agrigenomics market, owing to the changing paradigms in the industry. The report further includes a thorough analysis of the impact of the Porter’s Five major Forces to understand the overall attractiveness of the industry. The report also focuses on the key developments and investments made in the NGS in agrigenomics market by the key players. The commonly used strategy adopted by the key players to enhance their geographical presence is mergers & acquisition, followed by new product launch. Moreover, the company profiles section highlights significant information about the key companies involved, along with their financial positions, key strategies & developmental activities since the past few years. Further, the report includes an exhaustive analysis of the geographical split into North America, Europe, Asia-Pacific (APAC), and Rest of the World (RoW). Each geography details the individual push and pull forces in addition to the key players from that region. The prominent players operating in the global NGS in agrigenomics market are Illumina Inc., Agilent Technologies Inc., Ontario Genomics, Genome Atlantic, LGC Limited, BGI, Neogen Corporation, NuGen technologies Inc., Eurofins Genomics and Arbor Biosciences, among others. 10.5 Array Gen Technology Pvt. Ltd.
10.16 Pacific Biosciences of California Inc.
10.17 QTLomics Technologies Pvt. Ltd. The rising world population has resulted in an increase in the demand for food, while there has been an increase in the loss of crop and livestock-based food due to genetic concerns and climatic factors. The world population is expected to reach 9.7 billion by 2050, which further stresses on the need to employ advanced technologies so that, we can ensure sustainable productivity growth in agriculture. Agrigenomics provides an effective solution to the rising concerns by improving the productivity factor of the farmers. Agrigenomics helps the farmers, breeders, and researchers in identifying the genetic sequences which can be used to determine desirable traits and make better breeding decisions. The increasing demand for environment friendly innovative production methods, modernization in the agriculture sector, and high yield have opened new avenues of growth for the development in the agrigenomics technology. The NGS in agrigenomics market encompasses two major application which are crops, and livestock. The upcoming new and advanced technologies which have significantly accelerated the processes of genome sequencing are helping in the growth of the market. Advanced research and development in the livestock application such as, sheep, cattle, and dairy has increased importance of genome sequencing in the developed markets which is used to prevent various diseases in the livestock industry. The product type of agrigenomics include kits & consumables, instruments, and others. Amongst the various product type, kits and consumables are the most common product type followed by instruments and others. Instruments, currently is the fastest growing segment. The global NGS in agrigenomics market by product type was dominated by kits & consumables segment in the year 2016. During the forecast period, the instrument segment is expected to display the highest growth rate. With the increasing pressure on the global food production, and adoption of the NGS technologies in the agricultural industry, the demand for genome sequencing in crops, and livestock is expected to increase, which in turn would enhance the growth of the NGS in agrigenomics market. The market for instruments is also going to increase due to the emergence of new threats on crops such as, norovirus, Cyclospora, and Giarda. Kits and consumables are further segmented into sequencing kits, isolation & extraction kits, and others. Sequencing kits holds most of the share in the kits and consumables market. The development of genomic tools to assist in breeding decisions and cost and time factors are supporting the growth of the segment in the market. The trends of the NGS in the agrigenomics market vary across different geographical regions. The NGS in agrigenomics market holds a prominent share in various countries of North America, Europe, Asia-Pacific (APAC), and Rest of the World (RoW). Presently, North America is at the forefront of the NGS in agrigenomics market, with high market penetration in the countries such as, the U.S., Canada, and Mexico. North America accounted for the largest market share in 2016, due to the increasing technological advancements, and government investments pertaining to the agrigenomics segment. Asia Pacific is projected to be the fastest-growing region during the forecast period 2017 to 2021, due to its large market base for agriculture industry in the region. The competitive landscape for the NGS in agrigenomics market demonstrates an inclination towards companies adopting strategies such as, product launch and development, and partnerships and collaborations. The result of the emerging strategies and developments are helping the market in the form of more mergers & acquisition being done by the key players in the NGS in agrigenomics market. Moreover, the growing market of NGS in agrigenomics is further expected to increase the involvement of companies across different segments of the value chain. Illumina Inc., Agilent Technologies Inc., Ontario Genomics, Genome Atlantic, LGC Limited, BGI, Neogen Corporation, NuGen technologies Inc., Eurofins Genomics and Arbor Biosciences, are some of the prominent players in the NGS in agrigenomics market. The market has presence of several small-sized to medium-sized companies that compete with the large enterprises. The key players operating in this market have ramped up their merger & acquisition over the recent years, in order to generate public awareness about their existing and new products, and technologies, and to compete with the competitors’ product portfolio. This has been the most widely adopted strategy by the players in this market. For instance, in January 2018, Zymergen acquired Radiant Genomics. The acquisition enhanced the company’s product portfolio to be used in a range of industries which include agriculture, healthcare, chemicals and materials, and others. New product launches have also been significantly employed for expansion in the NGS in agrigenomics market. With the increasing growth in the global market, companies operating in this industry are compelled to come up with collaborative strategies in order to sustain in the intensely competitive market. For instance, in November 2017, LGC Ltd. launched SeqSNP, a novel end-to-end service for targeted genotyping using thousands of SNP markers. This service helps customers to accelerate their animal and plant breeding, and bring their products to market faster. In January 2018, 10X Genomics launched a new version of De novo assembly solution to provide the fastest and cost-effective solution for creating high-quality De novo assemblies to be used in plants. Moreover, extensive R&D activities and appropriate regulatory environments are also a prerequisite for the sustained growth of this market. Various government and private research institutes, and favorable trade policies are putting in substantial efforts to identify the benefits of these technology to be used in the agricultural industry. The need for sustainable farming techniques is necessary to bridge the demand & supply gap along with attaining sustainability in the production.